If you have missing or damaged teeth, you have probably looked into your options for dental implants. Implants can be costly and time consuming, requiring multiple dental visits and hours in the chair. This isn’t feasible for everyone. Luckily, dental technology is forever improving. 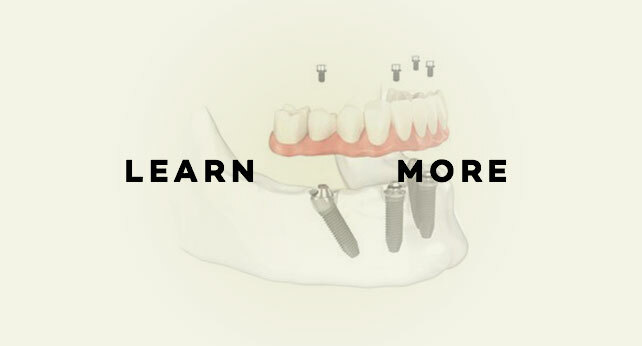 You may have heard of a procedure that’s becoming the gold standard in full arch implant dentistry called “All-on-4”. We’re here to tell you all about this service and some information to decide whether it’s right for you. What Does the Name “All-On-4” Mean? “All-on-4” is the name of a specific dental implant technique. This technique allows for an entire arch of teeth to be secured on 4 implants. The implants in the back are angled, which makes the treatment a possibility for people with bone deficiencies and jawline limitations. Because the entire arch is secured to just 4 implants, this procedure gives the patient the opportunity to walk away with a beautiful smile that same day. This streamlines the process making it easier and more accessible to patients, especially those with a busy schedule. Who Can Benefit From the All-On-4 Procedure? The All-on-Four implant technique is a viable option for most patients who would normally need dental implants. This applies to people with missing teeth or severe tooth damage and decay. This is particularly useful for people who would need multiple implants or dentures.The All-on-4 bridge is a fixed bridge, and therefore more natural and comfortable than removable dentures. What does the All-On-4 Process Look Like? As with all dental procedures, the first step to the All-on-4 process is to assess the best option for your dental health. This can be done at a regularly scheduled dental appointment, or you can schedule an appointment specifically to discuss your concerns. At this appointment, x-rays will be taken and the dentist will determine the best courses of action and lay out your options. If it is determined that All-on-4 is the right next step, further radiographs and scans may be taken, impressions will be made of your teeth, you’ll select the tooth color , and the lab will take a few weeks to build your new teeth. The next appointment is the main event. This will consist of the removal of any remaining teeth on the arch you are getting replaced. The four implants will be placed, and a temporary bridge will be secured. This is necessary to allow for healing before your permanent bridge can be placed, usually between 4-6 months later. This permanent bridge will be sturdy and durable, able to last a lifetime with proper oral hygiene and regular dental care. The procedure can cause some soreness in the jaw, but most people have little need for recovery time. With a bit of rest, most return to work the following day. Because the All-on-4 treatment happens in one visit for the main procedure and one follow up, it can be cheaper than the cost of having multiple implants done individually. Exact costs depend on your individual needs, but at Winterholler Dentistry & Implant Dentistry, we do everything we can to reduce costs for our patients. Generally, we are 30% lower than corporate dental implant centers, and there are never any extra fees to surprise you. We also offer financing with CareCredit and Wells Fargo Health Advantage. If you’re concerned about cost, that can be part of the discussion when determining your treatment plan. Do you have more questions about All-on-4? Give us a call!